To determine spatial (or: concrete) qualities, scientifically proven to have a positive influence on the health and well being of patients and staff, in order to offer the architect a helping hand for designing better hospitals. These measures are drawn from research that has been done in the framework of Evidence-Based Design (EBD), which can be perceived as the scientific variant of the healing environment. In the Dutch media the term healing environment is often used by architects, representatives of hospitals and researchers. Everyone provides their own content (colour, nature, treatment, hospitality, etc.) to this collective concept. The determination of concrete design elements, with a proven positive effect for patients, can contribute to the design of better care environments. Literature research and case studies. Spatial measures were selected from scientific articles from Evidence-Based Design research that are applicable for an architect. Only those measures were selected for which the effect has been proven sufficiently. The selection was based on scientific articles that have been validated by EBD expert teams. The measures in this study cover waiting rooms, consultation rooms, nursing departments, patient rooms and day treatment areas. A positive contribution to the efficiency and effectiveness of staff (chapter 5). The literature research gives information on how physical environmental interventions can contribute to the problems of the patient (such as lack of sleep). The selected measures are gathered in a checklist. This checklist gives an overview of all the validated spatial measures (from chapters 3, 4, 5). In the checklist it becomes clear which spatial measure can contribrute to which positive effects. Some aspects are more significant than others because they contribute to many problems (such as the one-person patient room); others appear just once and contribute to just one aspect. The application of EBD in recently built Dutch Hospitals has been studied using this checklist in the case studies. In the field research (chapter 7) nine recently built Dutch hospitals (Orbis Medisch Centrum Sittard, Isala Klinieken Zwolle, Meander Medisch Centrum Amersfoort, Jeroen Bosch Ziekenhuis Den Bosch, Flevoziekenhuis Almere, Maasziekenhuis Boxmeer, Deventer Ziekenhuis Deventer, Bright Sites VUMC Amsterdam, Alexander Monro Kliniek Bilthoven) were visited. Using the checklist the analysis is carried out as to whether EBD elements are used and if so how they are applied. The consequences for the architectonical quality. Does the frequent use of terms such as healing environment indeed reflect the application of design elements that have been scientifically proven? If certain aspects derived from EBD are applied, in which way is this done? This study has disregarded the extent to which the aimed effects of the measures, as attributed in the literature, are evident when these measures are applied in reality in the hospitals. A characteristic of this study is the fact that it has been done from the field of architecture. Design qualities are studied. For each case study the design drawings from the architect were retrieved and studied, and the hospital was visited. Also for every case study an interview was held with a staff member of the hospital and with the architect. The media was searched for each hospital from the field research to determine whether the hospital or architect mentions the healing environment. In chapter 8 all the gathered data from the cases are compared. The question about architectural quality is relevant from the perspective of the architect. 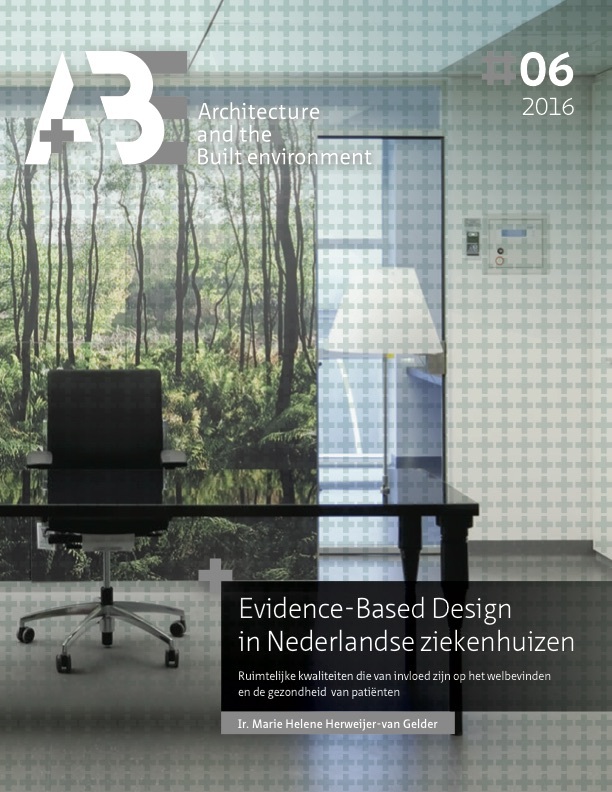 EBD gives little information about the quality of the architecture for the architect. EBD states that there are too few research studies about design. Most starting points are found in the paragraph ‘interior’ (such as variation and differentiation). Roger Ulrich writes in a few articles about an aesthetically pleasant environment, a hotel-like interior and being well decorated. In this he understates the importance of the quality of the design. Just sometimes he remarks about the use of colour, avoiding cheap furniture and the use of adequate lighting. For the architect design is important. For this reason, during the field research the design of the spaces was also observed: the analysis is not limited to the aspects derived from Evidence-Based Design. Therefore a professional analysis of architectural quality is possible. In chapter 9 the most significant aspects of architectural quality are described. In this part of the case studies vocabulary familiar in architecture and common architectural analytical methods are used. This part of the study gives information about the relationship between Evidence-Based Design and architectural quality. In chapter 8 the conclusion is drawn if and how EBD is applied in recently built Dutch hospitals and the most significant results using the checklist are described. Daylight and view. It was remarkable that in most hospitals many rooms are walled in, especially consulting rooms in outpatient areas. It also happens frequently that patients in rooms (for example day treatment), due to the interior design or the placement of furniture, cannot look outside. Nature. In almost none of the case studies was there an easy accessible (patio) garden that staff and patients can use. Patient room. More than half of the cases have the majority of patient bedrooms with shared bathrooms. Day treatment areas and multi occupancy patient bedrooms have, in almost all cases no design solutions that contribute to privacy, control, positive distraction or social support. Interior. Many spaces in the hospitals from the field research where patients and staff stay a long time have an institutional character. Rooms with an institutional character do not offer the possibility for control or positive distraction to the patient due to a lack of variation and differentiation in colours, materials, lighting and furniture. Also there is in none of the hospitals any art in rooms where patients stay a long time and need positive distraction. It is frequently the case that equipment and necessities do not have an obvious location or that no possibility is offered for putting equipment etc. in a cupboard. This contributes to the fact that many rooms are chaotic and unattractive. From the field research we can learn that EBD gives few concrete measures for design. A few EBD measures are important for architecture but they do not give actual rules for the design. The architect designs the totality of functional, programmatic and esthetic aspects of the brief of requirements. This study shows that the quality of the design is indeed important. EBD stands not in the way of architectural quality and architectural quality is no obstruction for the use of EBD. The functional and programmatical measures from EBD provide the architect with information to design better hospitals. The recommendations that EBD provides for design are also valuable. The field research showed that still many measures from EBD are not applied in hospitals. It is recommended that hospitals and architects take note of EBD in order to realise the positive effects for patients. In the field research an often-heard complaint was that the scientific basis of hospital design is insufficient: more EBD is needed. It is recommended that during the design and building process of a hospital attention is given to research (for example Post Occupancy Evaluation) in order to contribute to the body of knowledge of the positive effects of the 3. The field research showed that the quality of architecture is important in the experience of users and patients. It is recommended that more attention be given to architectural quality in the hospital environment. I also advise that the client gives more attention and is more involved in the design. The client can play a strong role in creating architectonical quality and making a better hospital environment.